Ojogbon Globalization: I have now become Prof. #BringBackOurGirlsNYC! I have now become Prof. #BringBackOurGirlsNYC! Today is one month and 7 days after the Chibok abductions in Borno State, Nigeria. Nigerian women's organizations formed the Women for Justice and Peace Coalition to develop and sustain a movement that created the #BringBackOurGirls campaign. They have had, and are having rallies all over Nigeria. More are planned. The worldwide response and support is so much appreciated. But there's need for more. I need your help. I consulted with the leaders and founders of the #BringBackOurGIrls in Nigeria, very powerful, admirable, strong and principled women. They wanted Nigerians in the Diaspora to stand with them and speak up. I decided to stand up and be counted. Please join me. Support for this issue puts you on the right side of history. Nigerian women have always participated in the political, social and economic life of their various communities. However, their participation has not been rewarded by commensurate representation in official positions of power. Incidentally, I did a 2007 study on Nigerian women's political participation), looking only at participation in the legislature via elections and in appointed positions in government. So, In addition to my regular beat, I've become a community organizer. All the stuff below is important but we need a position paper, op eds, etc. I can’t stop to do this until the semester ends and I hand in grades. I led the formation of #BringBackOurGirlsNYC to support the efforts in Nigeria and am a member of the Women for Justice and Peace Coalition in Nigeria. #BringBackOurGirlsNYC is a coalition of Nigerians, Nigerian Americans, Africans, Diasporan Africans and friends of Nigeria resident in New York City. We intend to redouble our efforts and continue to protest until these girls are brought back to their families. We also will work to better strengthen the dialogue concerning the #BringBackOurGirls initiative, and we encourage you to join and support us to urge the Nigerian government to rescue, re-unite the girls with their families, and provide them future psychosocial support so that they can be restored to some modicum of well-being. We also intend to keep this struggle alive until the safety and security of all Nigerians, and their access to education is guaranteed. Access to education for the girl child is particularly important in the Northern part of Nigeria where the abduction occurred. However, many poor Nigerians still struggle to access decent education, and their plight must be recognized, and viable solutions devised. We joined a coalition to organize a third rally, and the information is immediately below. Please come out to support us. Tell your friends and associates. Widely disseminate the information. MAY 23 RALLY ORGANIZING COMMITTEE. You are invited to join #BringBackOurGirlsNYC for the rally to call the world’s attention to the plight of Nigeria and the suffering masses of Nigeria on Friday, May 23, 2014 at Nigeria House, 828 2nd Avenue, corner of 44th Street, New York. However as Nigerians, we know that we have more at stake than these heartrending kidnappings. As such it is our duty to speak up and be heard! Bad governance, Lack of Accountability, Corruption, Injustice and other subversions of democracy are very pervasive in Nigeria. But there is hope. Other neighboring countries like Ghana, Liberia and Sierra Leone were once where we are now or even worse. That their situation changed for the better was not by accident, the nations of the world stepped in and helped them. Nigeria needs help! Let us also demand that Boko Haram be officially declared aterrorist organization by the United Nations, and that those supporting them face the consequences of their support. Date: Friday May 23, 2014. Place: Nigeria House at 828 2nd Ave, NY, NY and the United Nations on 2nd Avenue. If you have any question, please feel free to contact the undersigned or Mr. Dan Salami (718-207-7597); Mrs Yusuf- 860-357-4846; Pastor (Mrs) Olagunju 917-538-8773; Prof. Funke Okome (718 9515000, ext. 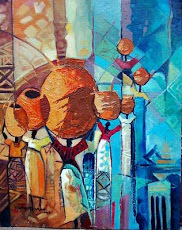 1742; mojubaolu@gmail.com) or your group leader. Thank you. See you at the Rally. I organized a tweetathon and #BringOurGirlsBackNYC has a "things you can do" list that it asks people to circulate in tweets and put on facebook + other social media. The list was composed for people outside Nigeria, and done in consultation with many others, including some members of Women for Peace and Justice in Nigeria. I am on Facebook now because I see that all the youth (and cool people?) hang out there and I want to reach the Nigerian and African youth first, and others next. Here's my facebook page https://www.facebook.com/mojubaolu.okome. I only started it on 2 Thursdays ago or so. 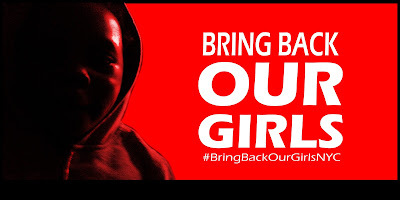 Here is the #BringBackOurGirlsNYC Facebook page: https://www.facebook.com/pages/Bring-Back-Our-Girls-NYC Like us on Facebook. #BringBackOurGirlsNYC had a few events to raise awareness and keep the issue alive until the girls are brought back to their families, and given all the psychosocial support they need to regain some modicum of normalcy. The press statement from our Mother's Day Interfaith Prayer and Candlelight vigil is attached. There are news clips, but I can't get to them right now. Check on both FB pages for constant updates. I participated in another rally at Staten Island Borough Hall on Saturday, May 17, 2014. It was organized by one of #BringBackOurGirlsNYC and NYC Council Member Debi Rose and a coalition of Staten Island groups. See pictures on FB. I edited two books last year (published by Palgrave Macmillan), that are relevant to this issue. Here are the links to free access to chapter 1 of each. http://www.academia.edu/4249022/State_fragility_State_formation_and_Human_Security_in_Nigeria_Mojubaolu_Olufunke_Okome_editor You can download chapter 1 free. All the chapters are relevant, particularly Chapter 6, but only chapter 1 is available for free. Below is a short clip of a rally in the rain, by Women for Peace and Justice Coalition members In Lagos, Nigeria on Reuters. Wimbiz (influential Nigerian women in business) had a town hall meeting in Lagos, Nigeria. Here is their action plan. Here is a news clip on the town hall meeting. It's the end of the semester and I must do all the grading, etcetera. I'm also putting out an issue of my online peer reviewed journal, Irinkerindo, which has been much delayed due to the balancing & juggling act I constantly do. Our press release for the Mother's Day Interfaith prayer and Candlelight service our list of "things you can do", are attached. I need your help to get the word out and keep this issue alive. NYC Rallies to Bring Back Our Girls!